Truck racks, the metal beams that fit on the back of pickup trucks, are an invaluable source of cargo area, preventative structure for carrying loads, and another layer of protection for the back area of the truck. These and many other reasons are the benefits that truck racks can provide the average truck driver. A truck rack can double or even triple the amount of cargo that can be transported by providing extra levels to stack anything from ladders, small boats, building materials, or refuse. Perfect for a construction crew, truck racks can hold and transport large amounts of paint, lumber, roofing materials, or waste. Their lightweight structure and simplistic design also do not add too much additional weight to the truck’s bed, allowing for additional weight to be added without worry for the truck’s body. By adding a piece of equipment that relies on suspending cargo above the bed and not in contact with the truck bed, a truck rack can also save a truck’s outer shell from the wear and tear that leaving the cargo in the bed can lead to. That same suspension also allows for additional area for cargo to be added above the top of the cab of the truck, as well as to the sides, while also leaving room in the bed for material that is less rough on that area. 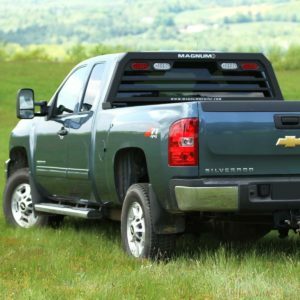 A truck rack also provides additional protection for the back of the truck in two forms, both in the event of a rollover and protection of the back window. Lightweight enough to not cause additional strain to the truck, truck racks are still strong enough to withstand stress and traumatic strikes without crumpling. Not a eyesore, either, truck racks can be color-matched to the truck they are attached to, and their easy assembly and removal give them a very versatile nature for the truck’s overall appearance. Truck racks can be very helpful in cargo hauling, assisting in business needs, as well as preserving the truck’s appearance. Light, strong, and durable, their reasonable prices and easy assembly make them a welcome feature on any pickup truck.